Createspace Independent Publishing Platform, 9781478104070, 590pp. Overcoming disabling injuries, Vietnam vet Paul Bernard becomes an award-winning journalist and television newsman known for holding a mirror to American society. Long critical of the radical right, after 9/11 he assails the Bush administration for letting Osama bin Laden escape and leading the nation into a disastrous war. On assignment in Iraq, Bernard is killed under suspicious circumstances. Interwoven with the account of his life is an interview of his mentor, Professor Augustus F.X. Flynn, by a writer profiling Bernard. Frustrated by Washington's inaction, the two set out to find the truth about the killing. Jan David Blais is a writer, attorney and aviation consultant. The airline story, FLIGHT PATH, was his first novel. 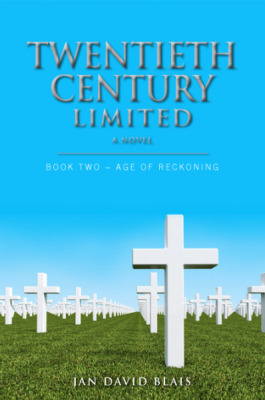 His second novel, TWENTIETH CENTURY LIMITED, is in two Books: BOOK ONE - AGE OF HEROES and BOOK TWO - AGE OF RECKONING.